As part of our efforts to help developers get started with building their applications and games on the Windows Phone 7 platform we’re planning a couple of events in Redmond (May 18-19) and Silicon Valley (May 25-26). If you’re interested, be sure to register using the links below. Get a jump-start on building apps for Windows Phone 7 with this 2 day hands-on training event. You’ll learn how to build Silverlight or XNA applications that take advantage of the many Windows Phone 7 platform features. We’ll introduce all the basic topics required to get started building Silverlight applications or XNA games. We’ll cover the Windows Phone 7 platform, the frameworks and both designer and developer tooling. We’ll also cover the process for publishing your application or game to the Marketplace. Topics covered will be reinforced with hands-on-labs where attendees practice on their own laptops. This event will take a basic approach so, while it may be helpful to know Visual Studio etc, that will not be a prerequisite. Developers new to the platform are welcome (encouraged, even!) to attend. Attendees are expected to bring their own laptops to follow along and to participate in the Hand-On Labs. Installation requires 3 GB of free disk space on the system drive. Knowledge and experience with previous versions of Visual Studio, C#, Silverlight and XNA is useful but not required. This event is free of charge. However, attendees are responsible for booking and paying for their own travel and accommodation. Both breakfast and lunch will be provided for session days. Redmond: Numerous hotels are available close to the Platform Adoption Center. For your convenience we’ve provided a hotel map of the area as well as a more comprehensive list of Redmond-area hotels. Silicon Valley: The Silicon Valley event will be held at the Hilton Santa Clara hotel. I’ve been thinking a lot about Windows Mobile lately (more on that, a lot more, later). As I looked at the device I’ve been carrying for the past year or so (Samsung Blackjack II) I’ve found a few things annoying so I recently set about fixing things. I’m sharing the solutions here for others who might want to fix the same issues. Caution: These are fairly advanced customizations to be making. If you’re uncomfortable with that sort of thing then just put the phone down and slowly back away as you’re liable to brick your phone. BTW, I used PHM Registry Editor to makes these fixes. Also, your phone needs to be “Application Unlocked.” I used the SDA Application Unlocker to do that. Again, both of these are advanced tools so be careful. 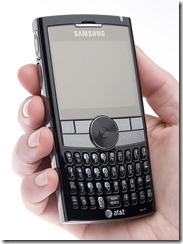 The single most annoying thing about the Samsung Blackjack II are the Startup and Shutdown sounds. I can’t imagine what the product manager was thinking when this feature was put in: “Hey, how about if it made a loud sound like, maybe a jet engine, whenever you turn it on or off? Yeah! Users will love that.” I find it incredibly annoying in many situations. Apparently I’m not alone as there are numerous posts about this on the intertubes. after changeing the value to *none*, back out to the main menu – wait a couple seconds and shut down and then restart, and you will find the annoying shutdown and startup screens and audio are gone. Can I get a menu over here? Another annoyance is more of a personal preference. I’ve been using what used to be called the “smartphone” edition of Windows Mobile. It’s now called Windows Mobile Standard. The big difference is that the screen is not a touch screen. I’ve always had a preference for a phone that I could use one-handed and had good physical keyboard so I’ve had a non-touch device since 2004. In the previous editions the menus all had numbers (aka accelerators) next to them to make selection easier. On the Blackjack the menus are selected by characters which, for me, is a little more difficult. ‘0’ will show 1-9 accelerators, and ‘1’ will show letter-based accelerators. The final annoyance is one inflicted by AT&T. Like many organizations their margins are squeezed and so look for any opportunity to sell their value-add services. AT&T has a whole slew of these that they’d love to sell me (GPS, shopping, music, video, etc) but that I have never used and do not intend to. Unfortunately they have hardcoded the 6 services near the top of the “All Programs” menu so I have to scroll past them every time I’m looking for a program. Connect the device it to your Windows PC using ActiveSync. You will see a file listing of all the Folders and Shortcuts displayed in your Start Menu. Select the Folders and Shortcuts you wish to remove and delete.